L'ensemble monumental de Tirgu Jiu is part of the Tentative list of Romania in order to qualify for inclusion in the World Heritage List. Targu Jiu in Romania, where I stayed overnight in January, has its "Monumental Ensemble" nominated. All the monuments, from west to east, "Table of the Silence," "Gate of the Kiss, "Church of the Saints-Apotres-Pierre-et-Paul," and "Infinity Column" are on one street "Calea Eroilor," in the center of Targu Jiu. So the nominated property centers on this street, and they have been trying to put this street in shape for the future inscription consideration. The Infinity Column was visible from far away. It just so happened that I had dinner (photo) on that night at the hotel "Europa" right on Calea Eroilor. 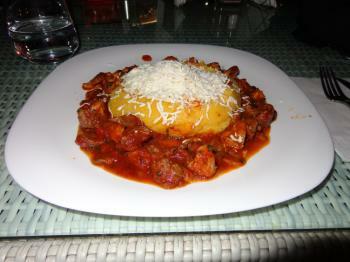 Although this dish itself has nothing to do with the nomination, and the making of it is not on the Intangible Cultural Heritage list of UNESCO, it does come from the nominated property and is one of the Romanian staples called "Tochitură," pan-fried pork in a spicy tomato sauce, served around polenta and cheese with a raw egg yoke hidden in between. It was a surprise when I found the yoke.